We often say, “we have the best customers on the planet”, and it’s so true! US Wellness farms have been raising quality food since 2000. 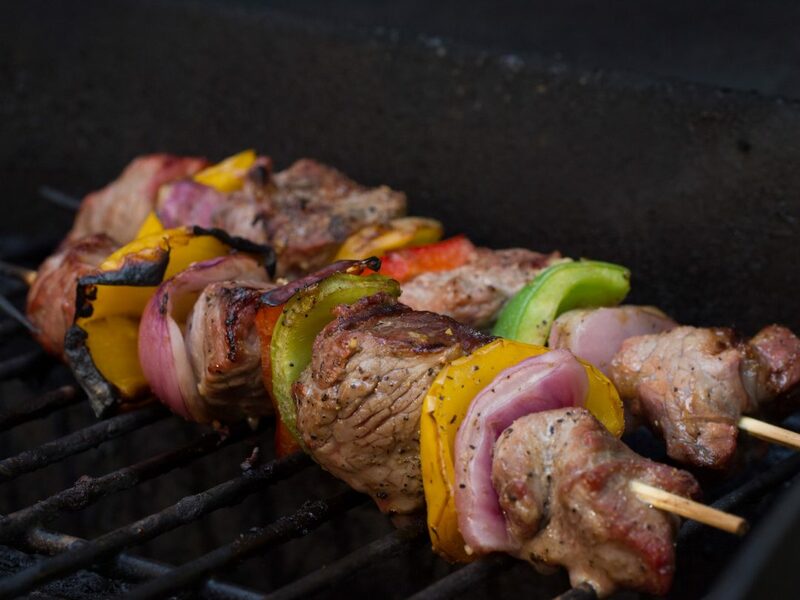 In that time, we’ve gotten to know quite a few gourmet home chefs who frequent our store at USWellnessMeats.com for the finest grass-fed and pasture raised meats. Our customers regularly share recipes on Instagram, Facebook, and Pinterest. Today, we’re pleased to share this gorgeous pasture raised Sous Vide Pork Belly recipe from one such home chef. This recipe makes use of a cooking technique called sous vide where precise temperature control is used to cook vacuum sealed food in a water bath. Sous vide means “under vacuum” in French. 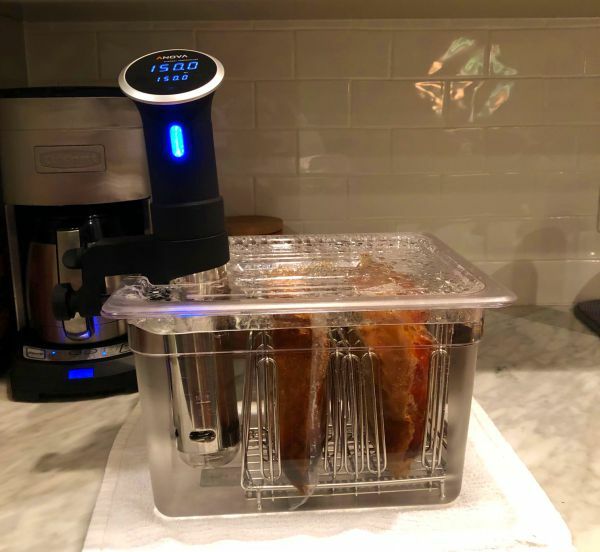 Sous vide has been used in professional gourmet restaurants for years but it’s now becoming quite popular in home kitchens everywhere. Once you try this Pork Belly, we’re sure you’ll understand why. Place 1 lbs pork bellies sections in 2 vacuum seal bags then slowly pour half of the marinade in each while trying to cover as much of the pork belly surface as possible. Vacuum seal each bag and then push the marinade around inside the sealed bag to ensure the marinade covers all of the pork. Place sealed bags in the fridge to marinate overnight. First thing in the morning place the pork bellies in the sous vide at 150 degrees. Ensure that the bellies don’t float and that over the 36 hours of cooking time any water lost to evaporation is replaced. After 36 hours, remove the pork bellies from the vacuum bags, pat dry with paper towels, and then place them on a cookie sheet or baking pan (I like to use non-stick foil between the pan and the pork) and place in a 500 degree oven (use convection if you have it) for five to 10 minutes, or until a nice crust forms over the surface of the pork bellies. Remove from the oven, slice and eat. 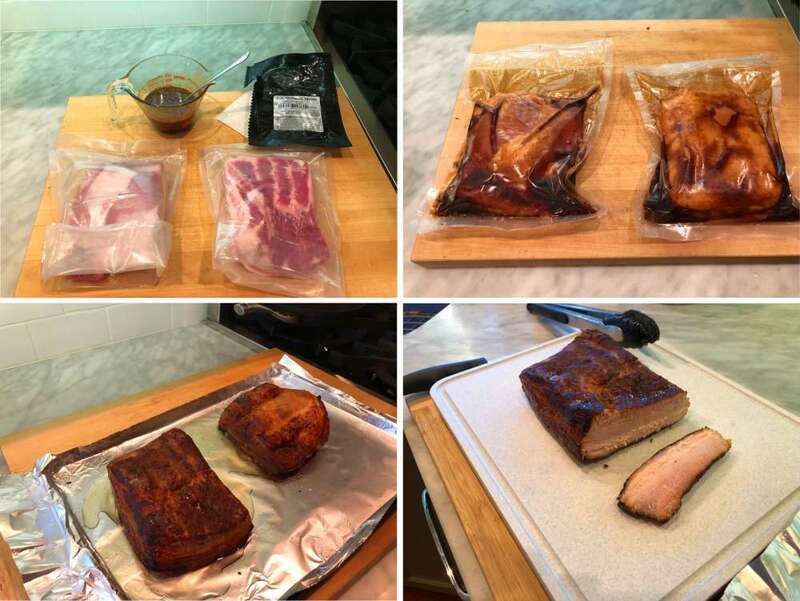 Our sincere thanks go out to home chef, Guy Jones for sharing this amazing Sous Vide Pork Belly recipe.